Knighthorse is imaginative, innovative and inspiring theatre, combining limitless energy and infectious enthusiasm with humor, passion, precision and professionalism. We have been traveling the world for the past eight years opening eyes to the magic and mastery of Shakespeare’s language. We have impacted thousands of lives and augmented hundreds of curricula. Everywhere we go, the question we are most often asked is: when can you come back? But don’t take our word for it, scroll down to read what people are saying about us. We have built our company on word of mouth, so it only seems fitting that we provide a forum for those who have something to share about Knighthorse and its impact on their lives. Ty and Amy are very talented actors and wonderfully creative educators. Their presentation helped me to understand Shakespeare as I never have before and drew me into the story so effectively. How wonderful to experience the truth that learning Shakespeare can be fun! The wonder of words, the importance of language, and the meaning of iambic pentameter all came across in such an enjoyable way. As an educator all my life, I truly appreciated Ty and Amy's ability to interact so well with participants and to capture the attention of the entire group. They opened minds and hearts to the world of imagination and to the wonder of Shakespeare. The vast majority of our students had no prior exposure to Shakespeare at any level. In fact, many have never attended a professional theatrical production. Nevertheless, Ty and Amy's expertise, enthusiasm and attention to the children certainly opened new avenues of theatrical experience for each of them. The staff and I were particularly impressed with Knighthorse's aggressive emphasis on engaging participants' imaginations. Encouraging students to envision the imaginary locales and defining what their sensory experience might be in any particular world proved tremendously entertaining; the benefit to their imaginative and cognitive development will remain for quite some time. Often, visiting groups tend to fall into one of two categories: those which "play down" to children as an engagement tactic and those whose delivery presents the subject matter in a manner far too dense and dry to incent active involvement from the participants. Knighthorse has crafted a balanced presentation that is fun, academically engaging and inspiring to student and teacher alike. 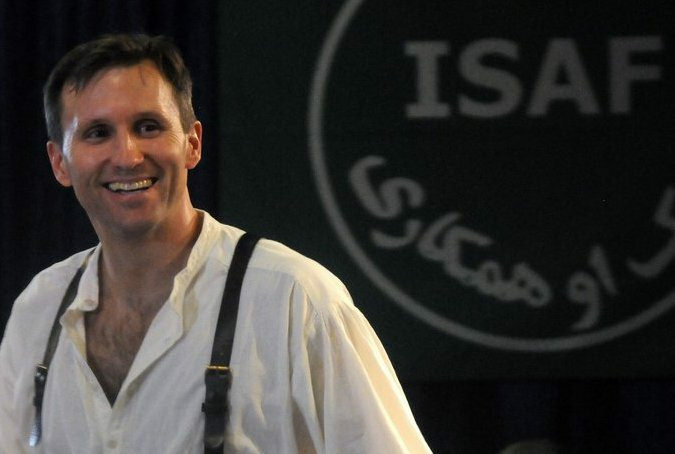 Thank you for your wonderful performances, and for your approach to Shakespeare that really connects with the audience and is open to kids wandering in and out. Because of my parents and my own early exposure to live performance, I have had a life-long love of Shakespeare which I hope to pass on to my daughter, and we both had a great time. I enjoyed hearing favorite passages performed with great energy and clarity, while she enjoyed hearing the works for the first time; and though I'm sure most of the words went over her head, thanks to your efforts she came away with the most important lesson: Shakespeare is fun! 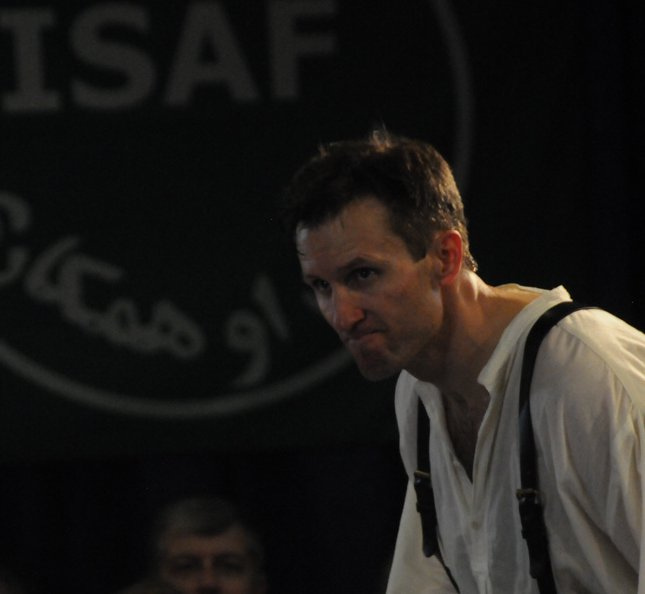 Even my wife, who has had little exposure to Shakespeare on the stage, and thus still struggles at times with the language, had a good time and commented afterwards that your performances were the most understandable she has ever seen. I feel a special connection with you and your mission because my father taught high school English for many years before retiring, and he would often arrange for small companies or individual performers to come and perform plays or recite poetry for his classes, and at times they would stay at our house, which was always exciting. It's encouraging to know that there are people like the two of you carrying on that tradition of exposing students to great theatre. I am writing to you to tell you of the strange effect you are having on our family. We have been lucky enough to see your show in Wellfleet for the last two summers. Each time I believed we were going to have an evening of entertainment, not a shake up of the whole system. Each time I was wrong. Two years ago we attended the Shakespearean Jukebox. My oldest son Dan (the 16 year-old in the front row, whose large feet Amy tripped over this last July) was absolutely bowled over. He had never participated in any theater before, as his main extra curricular interests have been sports and music. The intensity of the performance he saw made him want to be a part of the engine generating all that emotion and excitement. Because he was inspired by your presentation, he tried out for the high school production of West Side Story last year, hoping for a small part. He was over the moon when he was cast as Riff. It turned out to be one of the best experiences of his life, as well as opening his doors of perception to the joy of dancing and singing, two activities that had never been on his radar before. But on to my second tale. A few years ago I had encouraged my second son, Sam, to try out for the middle school play. He is a little shy, not interested in sports, a bit of a loner, a great musician and animator, and a very expressive story teller with a wry sense of humor. I thought theater would be a perfect place for him to find challenge and friends. Sam came home on the day of the audition in tears. He couldn't do it. The thought of standing up there in front of people completely freaked him out. Well last July you guys picked Sam to come up and read a part for A Midsummer Night's Dream. He was the blonde kid with the big grin that you had holding the lantern and the stuffed dog. I was holding my breath. What was going to happen up there with my son who just over a year ago was sobbing in my kitchen at the thought of being on stage? Well I guess he didn't have time to think about it and get worried about what might go wrong, because he had a ball up there. It was a lovely moment. Back to the present, just last week our high school held auditions for their fall play, All in the Timing. Sam, on the strength of that happy experience you provided, decided to try out for it. We all figured that just auditioning alone would be a good experience for him. As a 9th grader he didn't have much chance of getting a part, but he would prove to himself that he could get up there and pull off an audition. And maybe in the future he would be in a play. Well he had not just a good experience, but a great one. The stage hands were cracking up as he delivered the Holy Hand Grenade monologue from Monty Python and the Holy Grail (what could be more satisfying than to make upper classmen laugh?) and he actually got a callback. We still figured that was probably the end of the line, since there were over 40 callbacks, but Sam ended up with a part. Yes, he is Ramon, the ax murderer! All three of my boys were jumping up and down in a state of utter bethrillment (is that even a word?) when the cast list was finally posted at almost midnight. So I have to thank you for not only bringing theater into the lives of my children, but for bringing my children into the life of theater. I am so touched and delighted to see them having these experiences and discovering new strengths. The week of immersion in Shakespeare's literature and language was an invaluable experience for both me and my students. Ty and Amy's enthusiasm infused a new excitement for Shakespeare into all my classes. In preparation for the arrival of Knighthorse, the tenth grade honors English students completed an ambitious project: they adapted pieces of the text of Macbeth into 4-5 page narratives; they added settings, changed point of view, inserted characterization, and literally transformed scenes while remaining true to Shakespeare's language. When Knighthorse arrived, they, as well as the students, were excited about the project. Ty and Amy devoted a tremendous amount of their time and effort during an already hectic week to learn the students' scenes. We were thrilled to have an intensive workshop during which students read their narratives while Ty and Amy acted them out and inserted Shakespeare's dialogue. The atmosphere in the Little Theatre was magical. I know that this was an important interaction with literature and writing that neither my students nor I will ever forget, and one that would have been impossible without the dedication and commitment of Knighthorse. During the residency, Knighthorse also visited my senior elective, "Expanding the Canon of Poetry," twice. During the first visit, Ty and Amy involved the students in bringing the imagery of Shakespeare's sonnets to life by having them act out the images contained in the poetry. The activity was worthwhile, engaging and extremely fun. During the second visit, Ty and Amy once again devoted themselves wholeheartedly to an activity that I had planned for them. They illustrated the ways a poem's meaning changes when the subtext is changed. Once again, what happened in my class and to my students was amazing. Ty and Amy read a short poem which students had previously discussed using different prompts to change the subtext (i.e., "read this as if you are apologizing to your comatose grandmother on her deathbed…"). Without prior knowledge of what they would be doing in class, Ty and Amy were willing to jump in (very literally at times!) and again convey an excitement for language and literature that I know had a lasting impact on my students. Needless to say, I had a completely positive experience during Knighthorse's residency and appreciate their professionalism and dedication to education. The total impact of having Amy and Ty perform and interact with our students was wonderfully enriching for all. The two actors were conscientious, highly energetic and extremely professional. For the entire duration of their residency, they gave of themselves 100%. Throughout a variety of presentations, students were exposed to Shakespeare's plays as they were meant to be experienced—by seeing the scripts come to life. Both actors were extremely responsive to our requests and tailored a myriad of performances to match the instructional needs of our students. Over the course of one and a half weeks, our students shared in the opportunity of actively engaging in scenes from various plays. There were ample opportunities for students to clarify elements of the text and to ask questions. Knighthorse did an excellent job of immersing our students in Shakespeare's language, techniques, dramatic devices and implied staging. If our goals were to create an openness and receptivity among our students for the works of Shakespeare as well as an understanding that the themes embedded in his plays are still relevant today, those goals were achieved. The entire residency was educational, enjoyable and memorable. 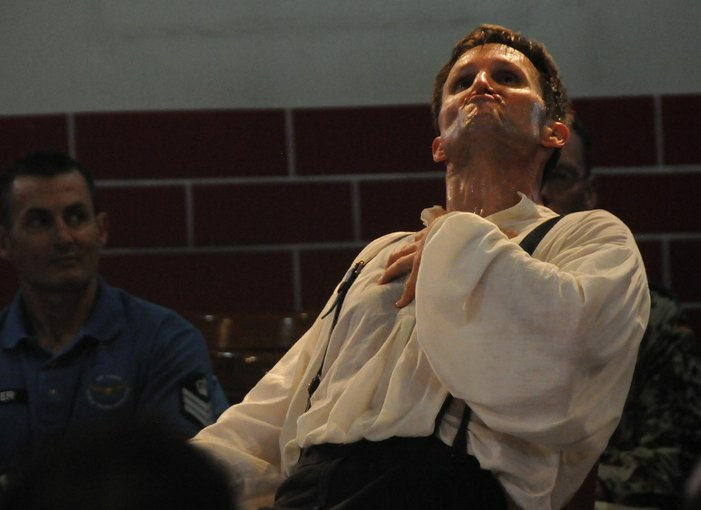 Our audience of 750 cadets—freshmen through seniors—were treated to a gripping presentation, a performance from which they literally could not remove their eyes. 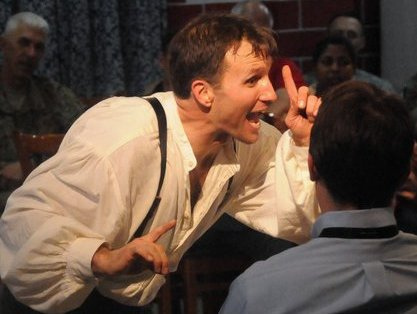 Ty put members of the audience on stage with him, involving them in the play; he circled the crowd with his sword drawn; he crawled into the seats, getting inches away from students' faces. 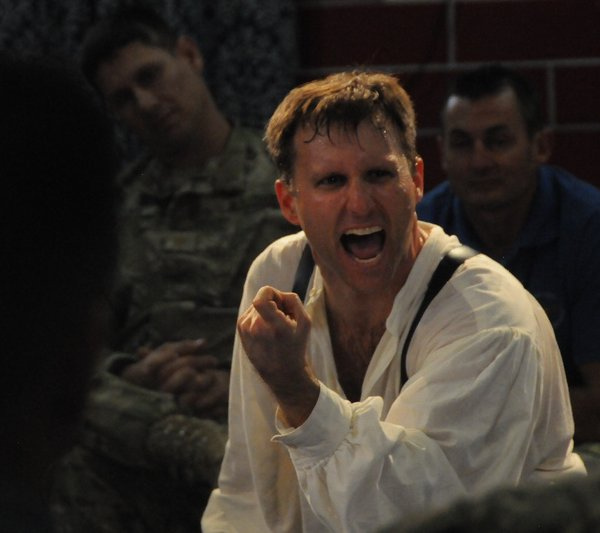 This kind of dynamism eliminated the difficulty of "Shakespearean English" for our cadets, because the nobility of a king, the folly of the French, and the spirit of a warrior came to life through Ty's very personal brand of dramatic interpretation. Especially thrilling was Ty's one-man fight scene where he mustered the strength and agility to act out the Battle of Agincourt. The audience gasped when he hurled his body from one powerfully choreographed engagement to another. 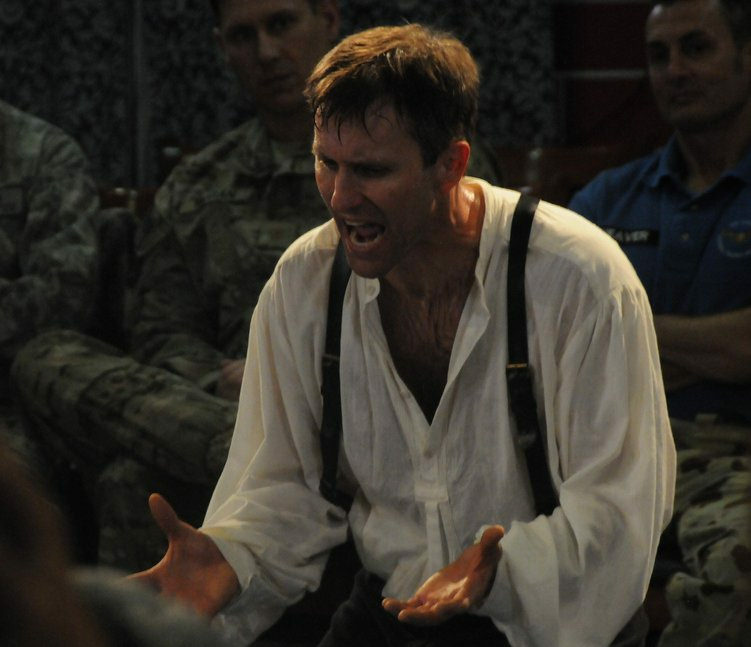 He did what few can do: the telling of a story through his body and voice, all for the sake of demonstrating to our Air Force men and women what courage, honor and great leadership look like, in the flesh. It was not surprising to me, then, when our cadets gave him a hearty standing ovation. Fantastic performance! Far beyond expectation! A Little Touch of Harry in the Night relies on the words of Shakespeare and precise acting to captivate the audience and stimulate their imaginations to see the battlefields, hear the clash of swords, smell the wood campfires burning and understand what it must have been like to be a King in command. An important component of the Greystone program is in-depth analysis of leadership characteristics. Through a series of classroom presentations and guest lectures, we discuss the essence of integrity, honor, courage, commitment, truth and trust for the purpose of cultivating leadership characteristics within our academy-bound students. A Little Touch of Harry in the Night significantly enhanced our study of leadership through the timeless words of Shakespeare. What made this performance so memorable and valuable was the "back stage" discussion hosted by Ty and Amy after the performance. They led my students on an in-depth exploration of the intricate details of not only the historical events, but also the personalities and motivations involved in Ty's portrayal of the characters. Ty and Amy are not only exceptional actors and producers; they are also accomplished scholars. Their willingness to adapt the discussion to coincide with our objectives made this performance applicable and meaningful.